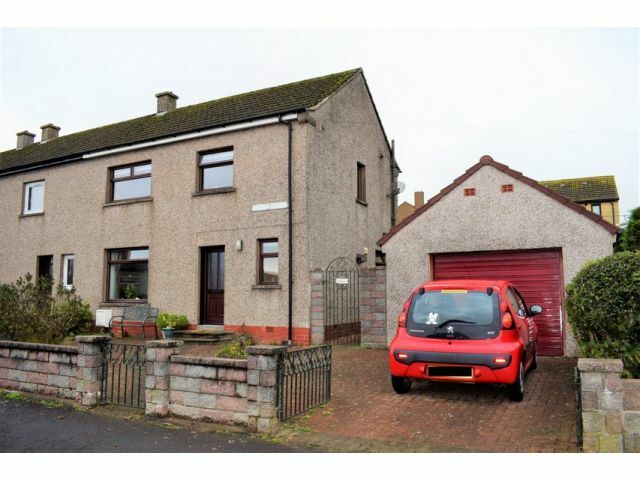 This well proportioned family home is offered for sale within a popular residential area of the town of Annan and is within walking distance of St Columbas Primary School and close to all amenties. 57 Shawhill Road would be ideal for first time buyers or as a buy to let investment. Providing Lounge, Dining Kitchen, Two Double Bedrooms, further Single Bedroom and Shower Room. Driveway parking, detached garage and enclosed rear garden with lawn, patio and landscaped areas. We can arrange a FREE, no obligation valuation of your current home! Call the office on 01461 205690 to arrange a day and time that suits you. Window to front with blinds. Ceiling light, smoke alarm, telephone point. Two storage cupboards. Radiator, carpeted flooring. Window to side with blinds. Ceiling light, range of wall and base units, integral electric oven and four plate electric hob, cooker hood extractor. Stainless steel sink and drainer with mixer tap, plumbing for washing machine and space for tumble drier. Space for fridge freezer. Radiator, tiled effect vinyl flooring. Door to rear garden. Window to side with blinds. Loft access. Ceiling light, smoke alarm. Balustrade. Carpeted flooring. Window to rear with curtain pole. Ceiling light, range of fitted furniture. Radiator, carpeted flooring. Window to front with blinds. Ceiling light, fitted wardrobes. Radiator, laminated flooring. Window to front with blinds. Ceiling light, large open fronted cupboard. Radiator, carpeted flooring. Opaque window to rear with blinds. Ceiling light, extractor fan, fully tiled walls. Three piece suite comprising of toilet, wash hand basin and shower cubicle with electric shower. Heated towel rail. Radiator, vinyl flooring. Block paved driveway and garden to front with mature planting. Detached garage with power. Enclosed garden to rear with raised patio area and rotary clothes drier. Lawn section and raised chipped corner. Outside tap. Garden shed included in sale.